WILDWOOD – Hundreds gathered at the Annual Conference stage with arms outstretched. They were publicly committing before their peers to go forth and passionately make disciples. 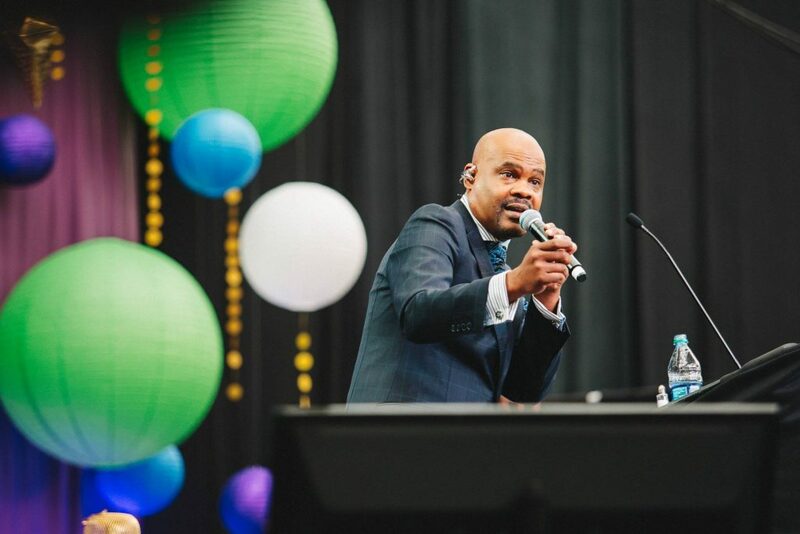 Junius B. Dotson, General Secretary of Discipleship Ministries, an international agency of The United Methodist Church, called them to take the lead in an address to the conference on what it means to be a disciple. He shared about the agency’s “See All the People” campaign, which attempts to ignite and inspire the spirit and movement of disciple-making across The United Methodist Church. “It’s an ongoing process,” he said. Dotson described a disciple as a Holy Spirit led follower of Christ whose passion every day is to know, grow in, live and share the life of Jesus. He challenged attendees to equip people so they can spend the rest of their lives daily pursuing their relationship with Christ, serving God and finding leadership within themselves. Dotson called United Methodists to quit worrying about fixing churches and the denomination and instead get super serious about making disciples of Jesus Christ. He praised GNJ for its definition of what it considers a vital congregation: a Holy Spirit led community of passionate disciples who are working together to grow new disciples, inspiring worship, active small groups, risk taking community mission and generous giving to mission. Rev. Dr. Susan Henry-Crowe, General Secretary of the Board of Church and Society addressed the Annual Conference the next day and highlighted the importance of a living wage, equal pay for equal work, caring for laborers and proclaiming and affirming the sacred worth of all people. Henry-Crowe explained how society has increasingly become disconnected despite living in a world more connected than ever. She shared troubling statistics of 27 million worldwide slaves, economic disparage throughout America, dehumanization of workers, and how the poor are often punished and stigmatized. Lamenting the negative effects of globalization, Conference attendees were challenged to imagine an economy that works for and honors the dignity and worth of all people and shift from a perspective of scarcity to an embrace of abundance. Henry-Crowe provided two websites for more information and to find ways to take action: Slaveryfootprint.org and UMCjustice.org.